In the late 1600’s, medical researchers, Willis (British) and Descartes (French), independently published papers declaring different areas of the brain controlled specific bodily functions. Interestingly, Willis engaged one of his medical mates, Chris Wren, to draw the diagrams for his book. Wren gave up medicine and took up architecture and designed a few Cathedrals, Abbeys and Hospitals, including St Paul’s Cathedral, and was knighted as Sir Christopher Wren. To complete their research, it is strongly rumoured one of the researchers had a financial arrangement with the local hangman regarding access to experimental material. A couple of centuries later a ghoulish researcher looked at the world through the eyes of a slaughtered cow and found the images were upside down. Linking the earlier research on brain segmentation to the upside down images, he deducted the eye only took images and it was an area of the brain that constructed the pictures. In the last decade an advanced MRI imager (FRMI) enabled researchers to pin point the area of the brain that reacted to images. What has this to do with the new Intermec EX25 scan engine? Traditionally a laser scanner sends out a beam that eagerly seeks a pattern of thick and thin lines that conform to an imbedded pattern in the scanner. Finding such a pattern causes a joyous beep. Apart from confirmation, there is a valid set of thick and thin lines, no lofty initiative is utilised. It has limited depth of field and no image capture facility. The new Intermec EX25 scan engine mimics the brain. Once the image is in memory, the Intermec EX25 scan engine can carry out a wide variety of analysis. This offers significant technical advantages. 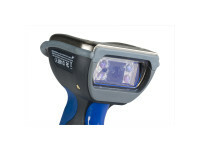 The Intermec EX25 scan engine can image a barcode from a few centimetres to around fifteen metres. Once in memory, it can recognise a conventional barcode or a stacked barcode (top code is product number and bottom code, a factor such as use by date). Intermec EX25 scan engine can recognise there is no barcode and this is an image recorded for proof of delivery or evidence of damaged goods. Intermec EX25 scan engine can recognise the new RSS (small size) barcode that will come into use in 2010. According to Gamma Solutions, the simple track and trace in logistics and the supply chain, was being replaced by systems architects wanting value added factors. The load confirmation data being sent to base via the EX25 scan engine capacity and an example was the new Intermec CN3 Mobile Computer with integrated GPS. This feature enables visibility on vehicle location and updates customers on estimated delivery times. However, this significant breakthrough should be recognised, which has been part of the structure of living creatures, since they first inhabited the earth . Intermec’s brainy technologists were certainly leaders in the data collection area in 2006. Whatever the Intermec R&D people are doing it must be working as they scooped the pool with technology advancements in 2006 including the prestigious Frost and Sullivan Award.